In any world view there will always be a basic assumption that cannot be proven. Religions have basic assumptions of a beginning, of infinite cause, of eternal chaos or a causative agent. Science has a basic assumption of the laws of physics. Children are onto something when they keep asking “Why?”. As a parent you try to answer, and answer and answer until you have to give up. Because there is always one more “Why?” than you have an answer to. And that only validates Gödel. Somewhere we are bound to accept some basic assumption as our core belief to settle the never-ending Q & A. It boils down to what you decide to accept as your core belief, the basic assumption. And in my experience that tells you a great deal about the core of the person himself. And since we have different basic assumptions in our world views, it makes for interesting discussions on this blog. Thank you. ← Can there be a beginning? Just perfectly written! This made my day ! Thanks for writing it, it is a “turning point”. Q-A, viewpoint, belief, assumption – all belong to the analytical mind. Which is a tool, a product. Experience, perception, sensing can happen-function very well without thought. As I wrote, there are 9 awareness (experiential levels) recorded in Buddhism. One can get “glimpses” of “higher” ones which are very “different” from conceptual (mind) understanding-experiences…direct ones which cannot even be put into thought or labelled. Seems like this dovetails nicely with Marty’s post on Integral Theory . I’ve laid out my views. Since they go back to an actual starting point, from the OP I guess I’d have to assume I made a wrong assumption. Assuming Godel was always right, that is. You may want to try disproving him. Can’t imagine why I’d want to try. We’ve made the assumption he’s correct. It is more than an assumption – it is a proof based on other, underlying assumption(s). I don’t think 2ndxmr has violated Godel’s theorem in the first place. Godel basically states that a system can’t be both consistent and complete. 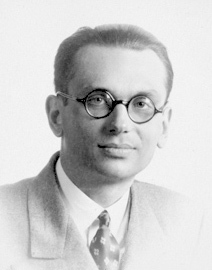 The 2x’s model is consistent, and the fact that he has an assumption (or more than one) as part of his model is what makes it incomplete – but Godel also indicates that incompleteness is part and parcel of any new theory. Geir: Somewhere we are bound to accept some basic assumption as our core belief to settle the never-ending Q & A.
Chris: True, . . . Or we could acknowledge that is what we humanoids generally do and instead, buck up our courage and continue to look. Step One might be to examine our own motivations for asking these questions. If we are doing it “to be right;” or “to win,” then we might only be investing in our bias and ego, and so miss the mark. However, if we are looking for the pure joy of exploration, seeking and distilling until we can smile at having arrived have at cleaner and purer statements of truth that has ever been known, then maybe we have to forgo the comfort and security of “rightness” for the netherland of “maybe-ness.” And maybe the Great Ones weren’t only brilliant geniuses but maybe they had similar amounts of courage to face down their assumptions with huge egos screaming at them to be importantly right rather than . . . true. I believe in the kid (in us). And the kid very seldom asks “Why?” to be right. Chris: True — the neverending Q & A. When we’ve asked why until we can see that we are on a neverending merry go round, that might be our queue to pause-reset-go take a bath-begin again. Maybe scrap everything and begin again. Einstein said it was insane to repeat the same action and to expect a different result. Maybe we can use this as a tool to notice the point where our inquiry becomes obsessive and to stop and to re-evaluate. Thetans are extremely free in nature, which means they are arbitrary. It is only in these lower MEST universes that everybody are forced to agree and hold on reality together. In earlier times one could believe anything, and it could be real and substantial for him. This means that TRUTH is mostly enforced by implants in these lower MEST universes where we are now. Faith is superior to truth, but one should understand that one can believe in ANYTHING and can believe HUGELY, not just hold some simple “implanted” beliefs in God or Jesus or some scientific doctrines. It is not worth fighting for truth, people should encourage creativity, imagination, etc. Truth, the MEST truth and the MEST laws are implanted into everyone here. On the long run these bring us sadness and unhappiness. One should cherish his own arbitrary wild creative ideas, fantasies, stories, etc. But one should recognize his own fantasies as such, and should not try to make others believe into his own fantasies as something real. More creative processing, in more free and easy forms, this can make people happy.